The Gay + Lesbian Rowing Federation is partnering with the French rowing club, Aviron Club Lyon-Caluire, to promote the 2016 Gods of Rowing Calendar (Les Dieux d'Aviron). The straight rowing club has taken a proactive role in advocating for the inclusion and acceptance [beyond tolerance] of gay and lesbian rowers, coaches, and race/regatta officials in the broader rowing community - right on the calendar! Each month gaze on a new image and ponder what these naked rowers might be thinking. Sit on the dock with them as they consider you and the greater rowing universe. Jump in their boats and get ready for their next stroke. Sit alongside them and cool your feet in the refreshing Rhone river. Take a picnic with the guys on the island. Join them for a post workout refreshment. Help them with their oars. Share their thoughts on the best way to stop another rowing machine test. 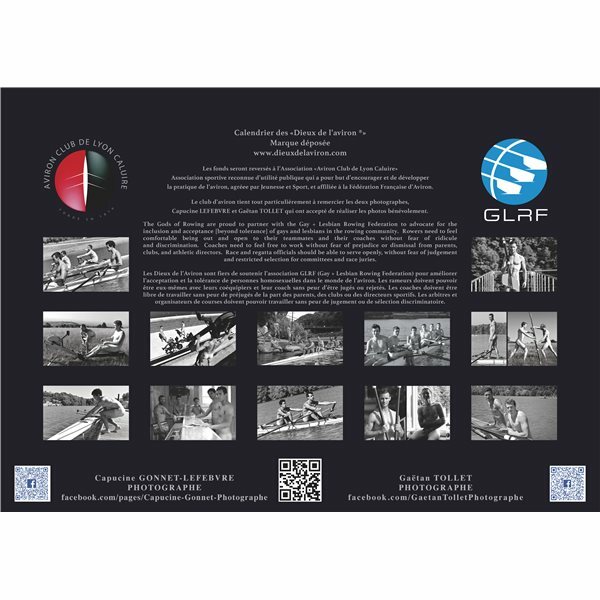 GLRF is honored to be the exclusive sales agent for the 2015 Dieux d'Aviron calendar for North America.